Kregel Publishers sent us a few books to check out that, ever since they have arrived, have been spread out on one end of our dining room table. 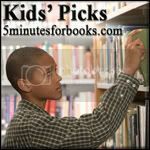 I think it's very fitting that they been talked about in conjunction with the Kid Picks carnival at 5 Minutes for Books because my son just loves playing with them and reading them! 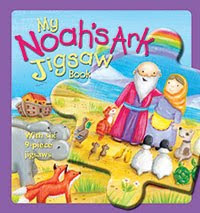 Just released this year, the My Noah's Ark Jigsaw Book and the My Nativity Jigsaw Book are perfect ways to engage young children who love puzzles with these two Bible stories. 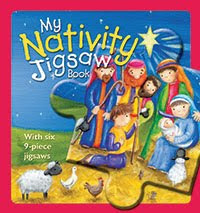 Of course, perfect for Christmas is the Nativity book and we've kept that one out for permanent play throughout the month of December. The story itself opens with an angel appearing to Mary saying, "You will be a mother; your child, God's Son." There is a 9 piece jigsaw puzzle that fits inside the opposite page for instant play if you so desire (or you can finish reading the story if you are so very lucky!). There are six page spreads and therefore six 9-piece puzzles within the book. In it, we travel with Mary and Joseph to Bethleham. We see the baby Jesus laying in the manger, and then meet the angels as they are appearing to the shepherds. I would recommend that an adult remove the puzzle pieces during the first use of the book to prevent destroying the pieces. (Or, at least, I recommend the adult of any 3 year old doing so!) The pieces come out easily enough after that and are of good quality. They will not rip easily and re-lock into the page and the square provided for the puzzle quite well. I was curious as to how well these puzzles would hold up with our three year old but he has been playing with them quite a bit and they seem to be doing just fine. Bookworm1 is right at the 9-piece stage so these are absolutely perfect for where he is at developmentally as far as the puzzles are concerned. The stories themselves are written to be well within the understanding of a two year old though. There are about two sentences per page spread to make it a nice, easy read. (This is probably a good thing, being that there are puzzles to distract from the story itself! Simple sentences are best and you can elaborate while working on the puzzle.) The illustrations are well done and are bright, cheerful and happy. Both the Nativity and the Noah's Ark books are appreciated around these parts: one because it represents a super, duper fun holiday and the other for the animals. But it's a start and it's right where we are at and therefore I appreciate them very much for the fun and the frolick! I think my little cousins might like this. Thanks for visiting today! I'm with Jennifer- books and puzzles do go together quite well. JAM has a Dr. Seuss one that has 6 puzzles in it, and it's such fun putting together the familiar illustrations.